Manchester City's Champions League campaign reached crisis point as they were beaten by CSKA Moscow on a desperate night at Etihad Stadium. Not only did they lose to two first-half goals from Seydou Doumbia, they also saw midfielders Fernandinho and Yaya Toure sent off after the break and ruled out of their next home game against Bayern Munich. 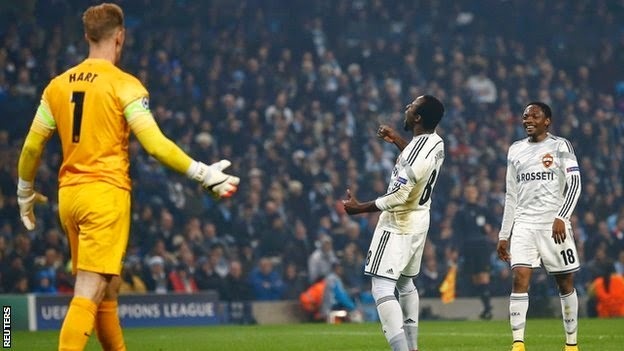 Toure had equalised Doumbia's first goal but that was a rare high spot in a dismal performance by Manuel Pellegrini's side, who simply cannot solve the Champions League puzzle. And on the evidence produced so far, it is hard to see a team that mysteriously looks so ill-at-ease in this tournament turning their performances around to produce the results to qualify for the knock-out stages.